As a junior majoring in equine business management preparing for my senior year, I realized that having an internship in the equine field would be beneficial to me after graduation. I decided to do an internship at YMCA Camp Seafarer as the Assistant Riding Director. 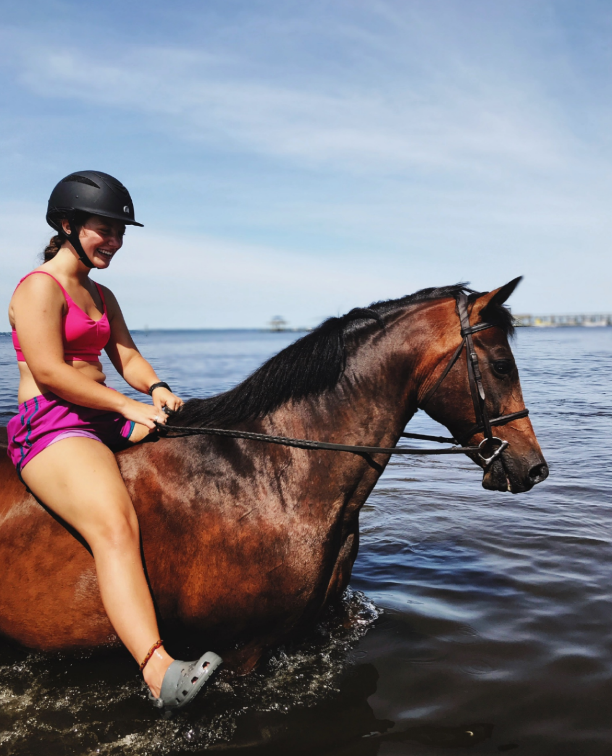 Camp Seafarer is an all-girls camp that offers a variety of land and sea activities like sailing, fishing, archery, athletics, creative arts, and horseback riding. 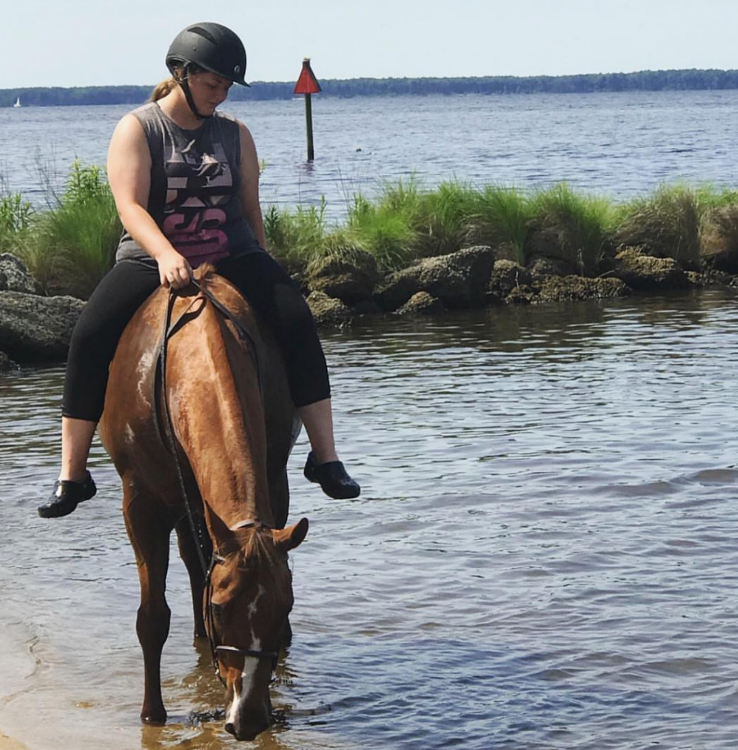 The horseback riding program at Camp Seafarer was originally started by Peggy McElveen and St. Andrews University has had a tight-knit relationship with the program ever since. 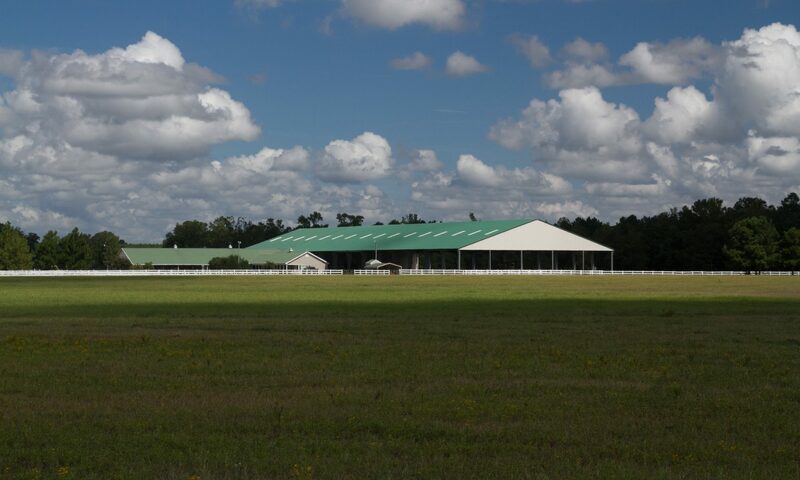 Every summer, St. Andrews Equestrian Center sends the majority of its horses to summer camp programs. The horses arrive at camp in late May and stay there until early August. 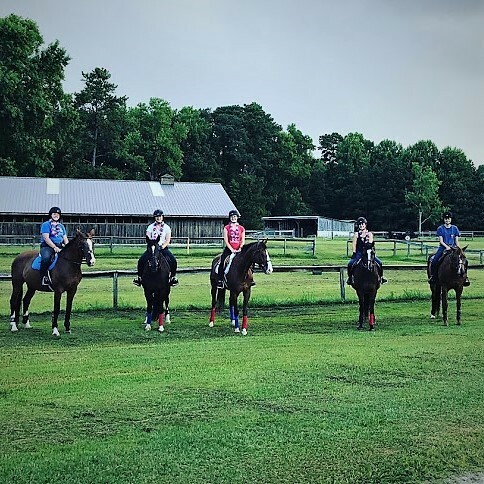 This past summer, twenty-four horses from the dressage, western, and hunter seat programs traveled to Camp Seafarer to teach girls in elementary, middle, and high school how to ride. Our days started with feeding and bringing in the horses at 7:30 AM. After breakfast, everyone groomed their three assigned horses and tacked up the ones being used in the first lesson. Lessons were held at 9, 10, and 11 each morning and instructors usually taught two lessons each day. Those not teaching at 11 picked stalls, filled water buckets and hayed all of the horses before lunch. On certain days of the week, we held trail rides from 2-3. Afternoon chores started at 3 with feeding and turning out the horses. After all the horse were turned out, we cleaned stalls, filled water buckets, and used a leaf blower to blow out the barn. Although during the week each staff member had a day off, Sunday were our easy days since we did not instruct lessons. Patrick has the sweetest soul. At the beginning of the summer, each staff member was put in charge of the care and upkeep of three horses. We were responsible for brushing our horses before lessons, bathing and clipping them as needed, washing their feed and water buckets, bedding their stalls and keeping their stalls free of cobwebs. Staff members were also responsible for keeping tack cleaned. I was assigned to two western geldings, Patrick and Darcy, and one hunter seat mare, Anna. Patrick quickly became my favorite with his sweet demeanor and he was so good with all of the campers. 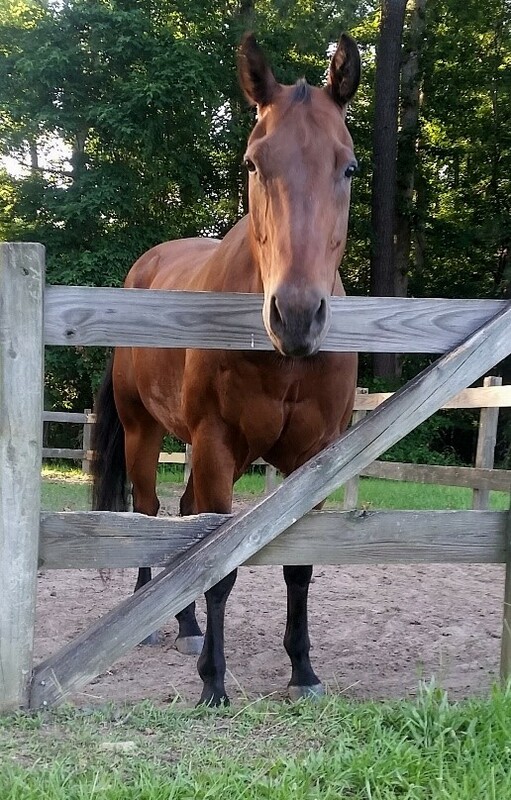 He greeted me every morning as I would come to bring him in and my favorite part of each day became feeding time because Patrick would always whinny excitedly for his food. Horses Get A Break Too! Going to camp is a time for the SAU horses to relax a bit and have an easier workload. Eddie didn’t behave too badly and a few strong, demanding girls rode Dart. Although a little nerve-racking, many beginner riders, who’s legs barely went past the end of the saddle flap, learned to control and steer Sam and Dano. Although they had their days, all of the horses enjoyed camp and were happy to have a little break. During my internship, I learned a variety of things that will help me throughout my career. I learned how to plan and instruct engaging, safe, and enjoyable lessons. Working with children of different age levels taught me how to explain skills in age-appropriate ways so that all riders understood me. My confidence in instructing beginner lessons grew immensely over the summer. As Assistant Riding Director, I helped create the lesson schedule for the second session of camp. I learned how to schedule lessons around camper activities and how to group campers depending on their riding level and prior experience. Another responsibility of the Assistant Riding Director is to oversee the riding program in the absence of the Head Riding Director. 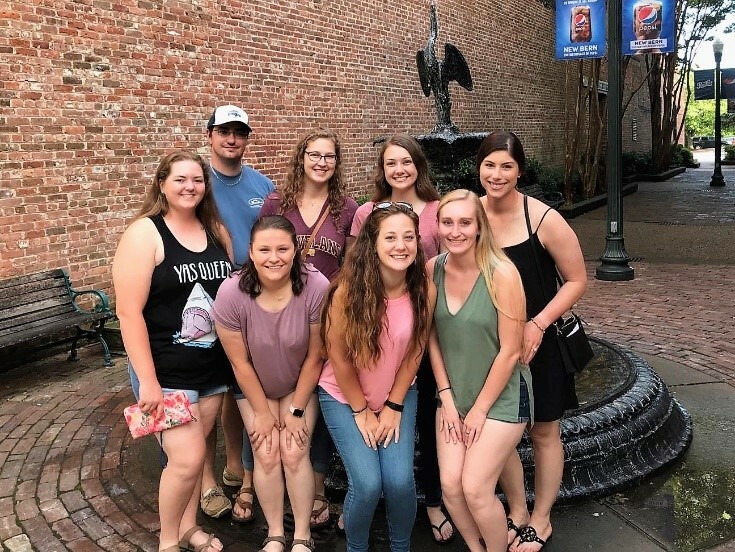 Many of the staff members working at Camp Seafarer were also St. Andrews University students and my friends and teammates. Being in this position taught me how to balance the challenging aspect of being a peer and a leader. I learned the importance of communicating effectively and confidently with my staff as well as my supervisors. This ensured that my team members took me seriously and worked together to make sure that our responsibilities were cared for. Overseeing the program also taught me how to handle a variety of situations, such as how to come up with fun and engaging horsemanship lessons quickly when it started pouring rain and campers were not able to ride. 4th of July ride around camp. While taking care of the horses and teaching lessons was hard work and took up most of our time, staff members were able to have some fun! On the 4th of July, we woke up extra early to bring in the horses. Before the bugle sounded at 7:30 to wake the kids up, we rode around the cabin areas of Camp Seafarer yelling “The British are coming, wake up!” to get the campers out of bed. It was fun to canter the horses around different areas of camp and see how excited the kids were to see the horses in the morning. Between the two four-week sessions of camp, when Camp Seafarer was quiet because there were no campers, some staff members rode the horses down to the beach and went swimming. While most of the horses were a little hesitant at first, they all gained the courage to walk into the water. Platina loved splashing herself and Bruce Lee and Dart enjoyed seeing how far out they could go before their hooves left the bottom. Emilie Peedin (’19) swimming with Bruce Lee. The next to the last week of second session, when kids and counselors are tired and want to go home, Camp Seafarer hosts the Big Kahuna Cup. This is a week-long competition where the staff of each activity area at Camp Seafarer chooses a theme. Horseback riding decided to choose the Royal Wedding. Unfortunately, that week was rainy so we did not ride much but we played a lot of indoor games. Riders got to play bridal party games like making a wedding dress for their instructor and having a wedding ring scavenger hunt. In the middle of the week, the staff held a ‘royal wedding’ for Beckett and Anna. The kids loved seeing the horses in a makeshift wedding dress and tux. The day after the wedding, the barn staff switched to a tropical honeymoon theme. My summer internship at Camp Seafarer was beneficial to me in many ways. Besides confirming that horses are indeed my true passion, it helped me know that my vocational calling is in the equine industry. For Equine Business majors, internships, like the one at Camp Seafarer, enhance your resume. “Having an internship is evidence of planning and pursuing your career objective. You may also get an offer to return to that employer after your graduate” (forbes.com). Internships provide work experience in the industry and are a great learning experience. I learned more about myself while also adding to my overall knowledge and skill. Alexis Grimes (’21) and Ziggy. If you are wondering what to do during your summers at college, think about doing an internship. Internships are very beneficial. Not only will you gain more skills and knowledge that will benefit you in your future career choice, you will also learn more about yourself. I enjoyed my summer at Camp Seafarer so much that I will be working there again this summer!